As a group of cynical developers, we blamed the company’s lack of legit sales and marketing. I didn’t know this then, but we also lacked something called product management. Had we had a product management practice, the real problem would have been uncovered sooner and cheaper. There was a market condition keeping our innovative product from being viable for sale. Hollywood wouldn’t release any content for streaming. Pirating platforms like Napster were running wild at the time, and movie houses saw no way to monetize streaming video. In fact, they feared streaming video would lead to nothing but the theft of their assets. Ready to dive into Product Management? Anne Steiner is a product geek, influencer, and coach who guides large and small companies in managing the challenges that come with innovation change. 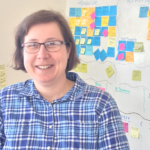 With over 20 years’ experience, Anne developed a strong interest in identifying and solving customer problems, driving her deeper into the user experience and ultimately, into product management.